Flowers are probably my favourite subject matter. Coming from a scientific background I initially painted them in a very botanical style - every detail is important to me! 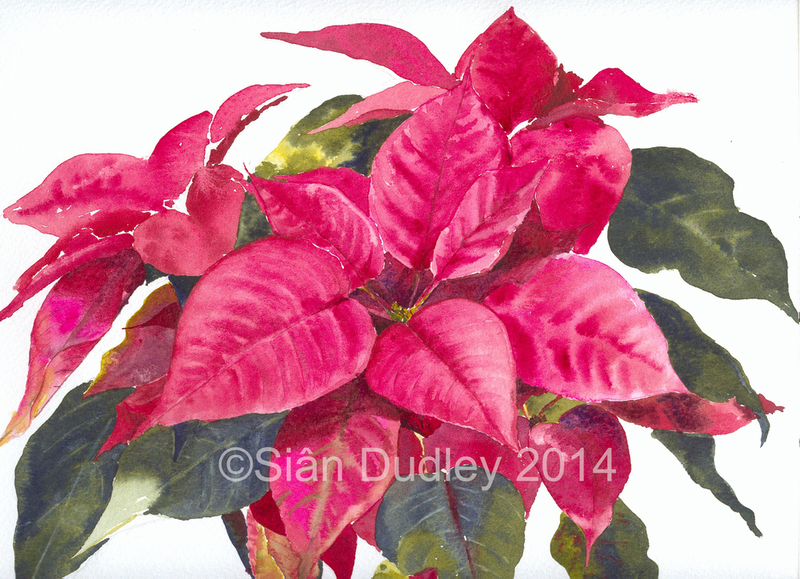 As time went on and I became more fascinated with watercolour as a medium I allowed the paint to play its part. These days I respond to each flower or plant differently, picking out the features I am excited by; this can be the colour, the way the light comes through petals, its habit, or even its shadow! For details of each painting please scroll down. This website is currently undergoing some major improvements, and we hope a 'shop' will appear very soon. In the meantime, if you are interested in purchasing one of the paintings below, please contact Siân. My dear mother used to plant tulips in a long single line, like soldeirs on parade. When I saw these Queen of the Night tulips, wearing their bearskins, I just had to paint them! This painting was produced while filming for ArtTutor.com ; members of Art Tutor can view the step-by-step video. The rather unusual title for this painting came about because Rob felt it was posing the same way that James Dean did in a very famous poster. Sometimes I think his mind works in weird and wonderful ways! Please state your preferred presentation when ordering.